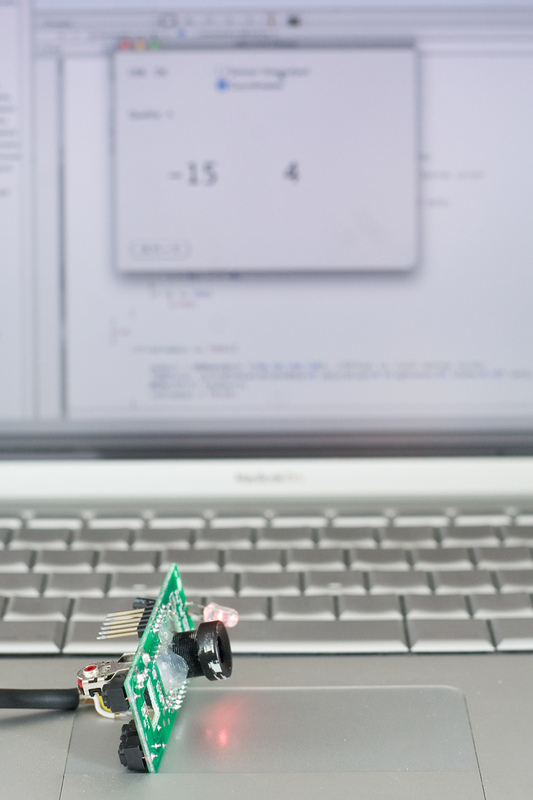 2D positioning: hacking an optical mouse! For my next project, I will need to know the relative position of a moving (<10cm/s) object above (+/- 10 cm ) a surface (flat, but of any quality). 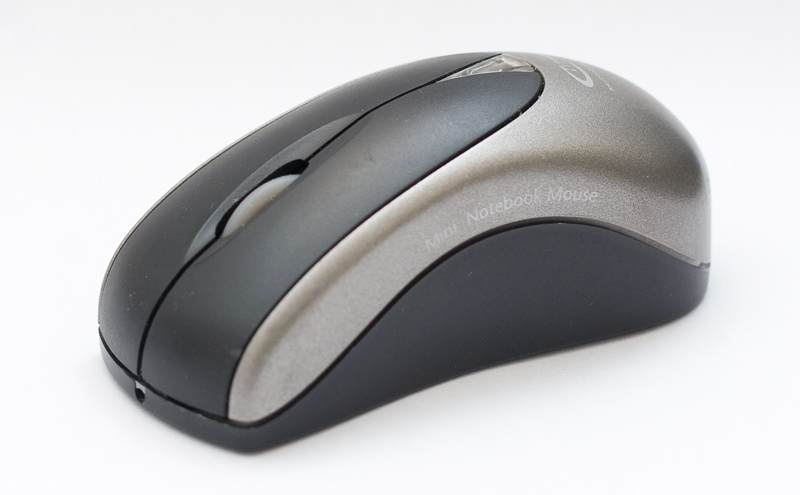 After playing with accelerometers, I realized it won’t work (damn you, gravity) so I took the other option I thought of: an optical mouse. A regular optical mouse contains a chip, usually from avagotech (Agilent company) with a small 16*16 CCD sensor, taking pictures at high rate of what’s under the mouse. It calculates the “travelled distance” by looking for differences from several pictures and outputs the value via an i2c bus or QAM pins. 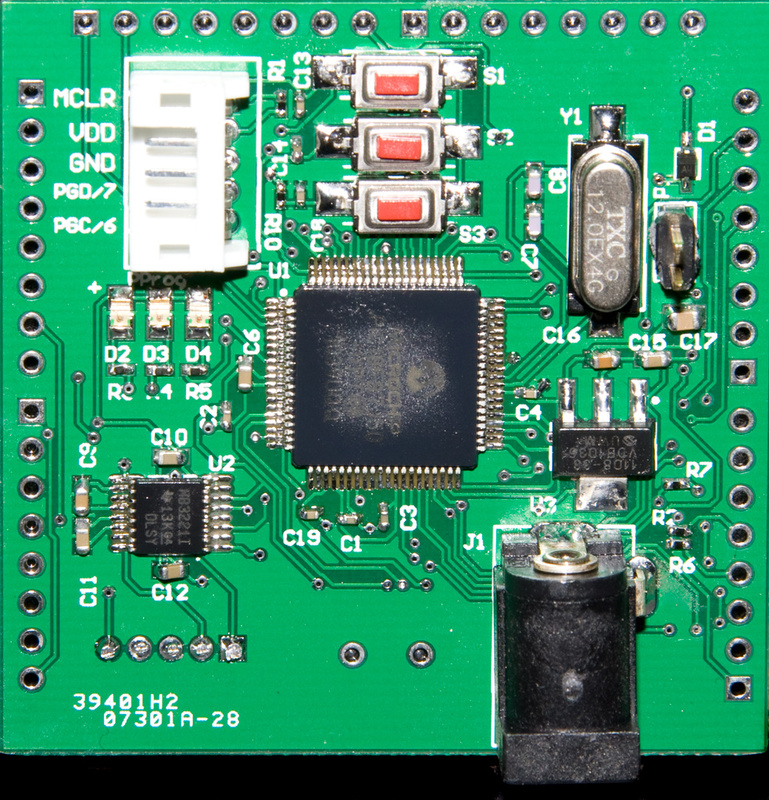 A microcontroller interfaces the first chip with the USB or PS/2 port and also decodes the buttons/scroll wheel. The “Mini Notebook Mouse”, from the Typhoon brand gave her body to (my) science. Luckily, it contains the A2051 sensor. The datasheet is freely downloadable on Avagotech’s website (link) [EDIT: Not anymore. But you can get it here]. The electronics are just two PCBs, stacked and connected with two 6-pin headers (easy to separate). The bottom one has the sensor and its red LED, the buttons and the encoder for the scroll wheel. The upper one, the chip with the USB capabilities. On the left: My USB dev board with a PIC18F87J50. In the middle: the sensor PCB. On the right: the desoldered PCB for interfacing the sensor and buttons with the PC. It has 400/800 cpi resolution , with a two-wire SPI interface. The CCD is on the other side. The main problem is that the focus distance of this kind of sensor assembly is very narrow, about +/- 3mm. I needed more. All the optical mouse sensors have a function to get the actual image of the surface below the mouse. I wrote a small software to get that image. 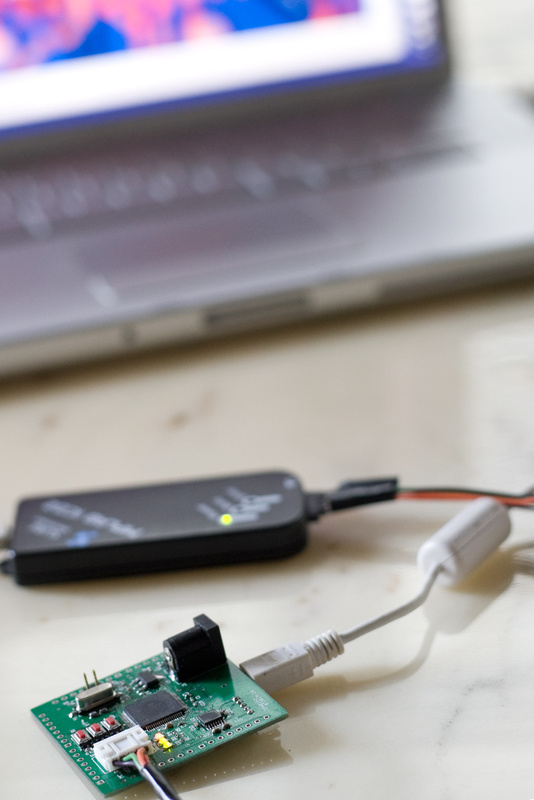 The sensor is connected to the USB dev board, via the SPI interface. I used these small lenses for security cameras/babyphones, like this one: Mini 12mm Lens (but you can find cheaper ones on eBay, I saw some for $7). They’re easily opened unscrewing the front part (need to heat the glue on the thread sometimes) and contain between two and four small optical elements that can be re-arranged to get different magnifications/view angles). After a lot of try-and-error, I managed to get a good combination of optical elements. The positioning is really precise, but depends of the contrast of surface the sensor “is looking at”. Two functions to read/write to the A2051 optical sensor. Nop();  //Let the sensor read the sent bit. LowerB.Val = ReadSensor(0x0C);//"LowerData" Contains the pixel value, 6bits. UpperB.Val = ReadSensor(0x0D);//"UpperData" The MSB indicates if the pixel in LowerData is valid. 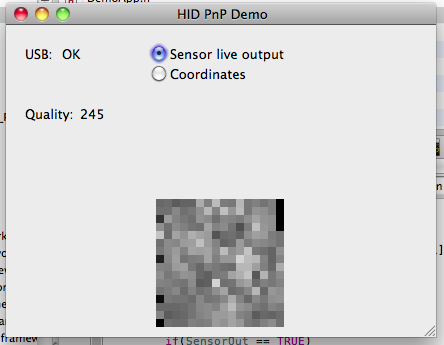 The Buffer will contain the image from the sensor. I send it via USB to my mac application. The next steps will be to build a frame around the PCB, integrate it to my project and see how good the positioning gets with different surfaces. I’ll probably still use an accelerometer to measure the tilt angle of the optical sensor and to provide a backup continuity in the displacement measurement in the case the surface contrast gets too bad for the sensor. Inspiration from this article: Sprites mods. After I received the PCB ordered form iTeadStudio last week, I soldered the components today. So far, everything related to the quality of the PCB looks fine. The footprints match, the FR4 substrate handles the temperature well (1 mm thick option) and the HASL finish is ok and easy to solder on. It changes from my hand-etched PCBs. I successfully programmed the PIC with Microchip’s USB device example firmware. Unfortunately, the board wasn’t recognized once plugged. The LEDs were blinking, but nothing in the USB device list. After some investigation and noticing that the LEDs were brighter when the board was powered by USB than with the external power supply jack, I found the problem: I have dyslexia. Or rather, let’s say: “Don’t name you schematic nets with names that one could mix up” Indeed, in the schematics I inspired myself from, there were two different nets with very close names. One called “Vbus” and the other “Vusb” all written with caps / small caps. And of course, I connected the Vbus to the Vusb and when powered with USB cable, the 3,3V regulator was by-passed and the PIC was fed +5V directly to its “VUSB” pin. Luckily, the PIC didn’t die, even if +5V is over its maximum voltage rating. 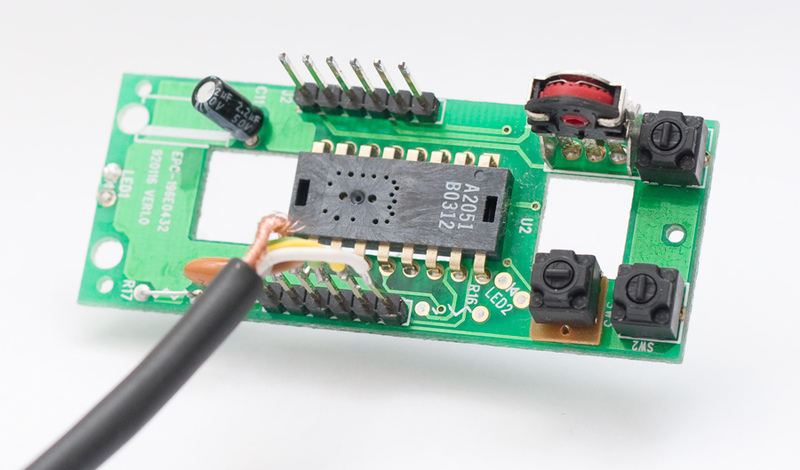 The PCB was easy to fix by cutting a track, adding a wire and de-soldering a diode. Unfortunately now I have to be careful to not plug an external power supply when my board is plugged to a computer (no more protection preventing back feeding of current to the USB cable). Well, I should live with it. 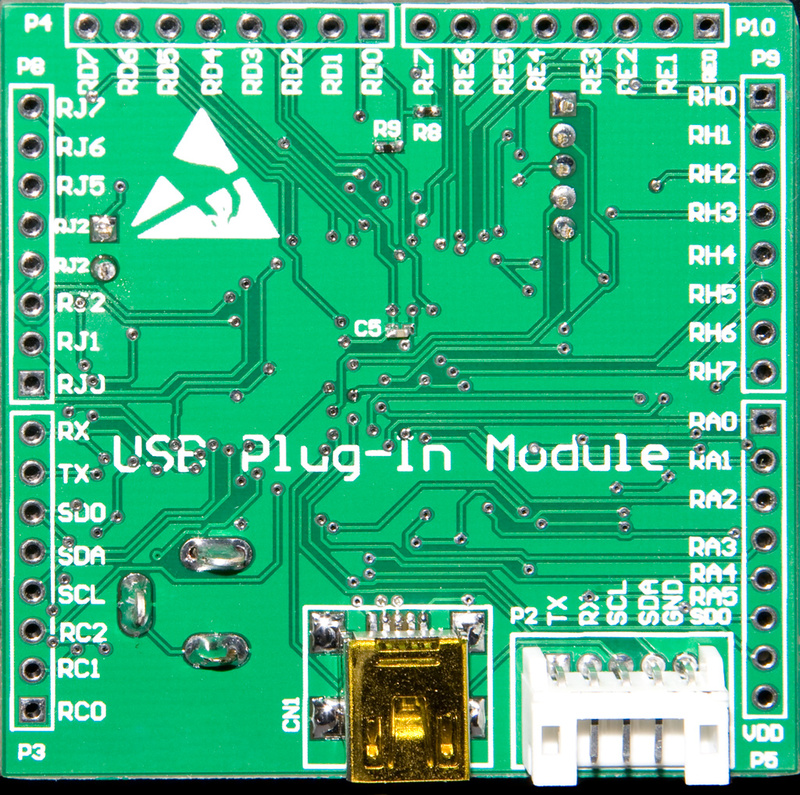 This board is inspired form Microchip’s FS USB plug-in board. I added a Texas Instrument’s RS232 transceiver (MAX3221), three LEDs, three push buttons and connectors with the six GPIO ports from the PIC. I’ll play with it now to see what I can do with USB and all those GPIOs. I’m offering my knowledge for free, but you’re welcome to donate!